Dasycercus cristicauda (Krefft, 1867), South Australia, Australia, probably Lake Alexandrina. Two subspecies described. 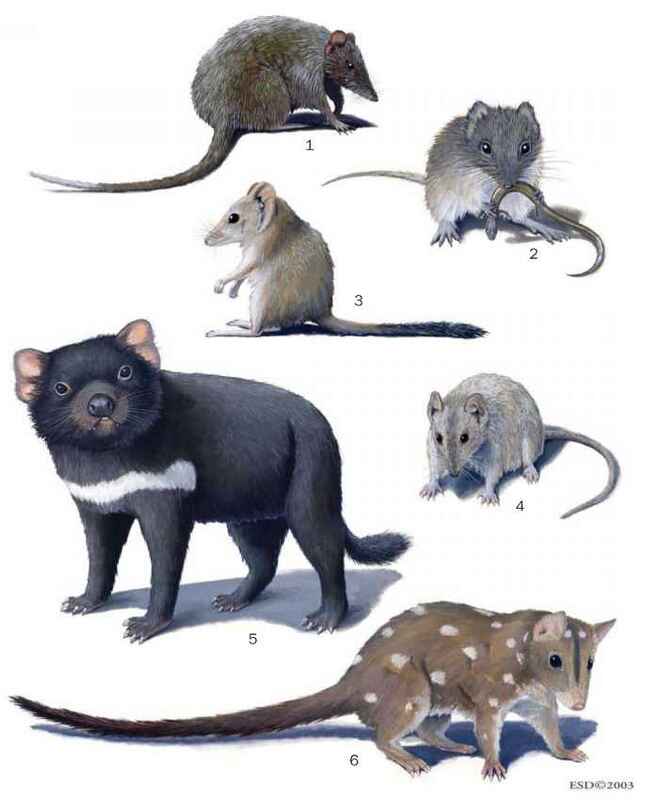 OTHER COMMON NAMES English: Crest-tailed marsupial mouse. Length 4.9-8.7 in (125-220 mm). Light brown above, pale below with crest of long black fur distal two-thirds of short tail; short, rounded ears; stores fat in the base of the tail. Lives solitarily in burrows it digs in flats between or on lower slopes of sand dunes. Generalized insectivore, takes small vertebrates. Quite long-lived for a dasyurid. Breed for up to six years and produce up to eight young. Probably promiscuous. Vulnerable. Decline possibly a result of predation by introduced foxes and cats, and changes in fire regimes. Susceptible to decline because of larger body size and restricted habitat.